There are number of ways to symbolize your unity during a wedding. I recently officiated a wedding where the couple incorporated a Love Letter Ceremony Box. (They also had a Unity Candle.) The wedding they designed included the lighting of their unity candle, followed by a flower presentation to their mothers, and then the Ceremony Box element. Prior to the ceremony, the bride and groom had written heart-felt letters to one another that expressed their feelings about their beloved. The letters were sealed in envelopes and placed in the box during the ceremony. 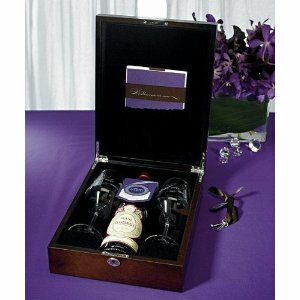 The box also contained their favorite wine and glasses that had been personalized. 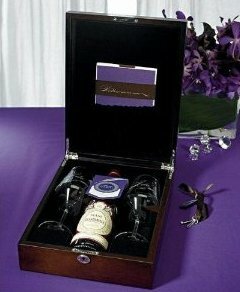 Their plan is to open the box on their fifth anniversary and share the wine and letters with one another. Amazon.com lists such an item as Love Letter Ceremony Box Set. A number of vendors sell this particular item. The price varies quite a bit – from under $70 at Amazon to around $120 elsewhere. What out-of-the-ordinary unity elements have you seen? We blended two colors of wine and then shared it in the glass we had printed with our names and wedding date! It tasted wierd but it was different. We used a canvas and painted a heart on it. He painted the right half while I painted the left. Then our guests signed it with a sharpie at the reception. We framed it and hung it in our apartment.